There’s a bay just north of Seaburn where the land drops down an escarpment to a narrow field above a shallow beach. 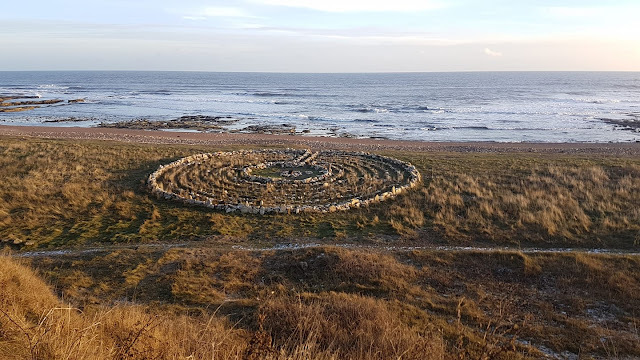 There in the field, overlooking the North Sea, someone has made a prayer labyrinth from found stones, has claimed this sparse strip as holy ground. The land of the venerable monk Bede, the first person to write a history of the English people. Every ten paces along this coastline there’s a bench-seat facing out to sea, each one with a plaque screwed into the backrest, remembering a loved one who used to stand on this coastline and look out at the horizon. Some never crossed it, never left. Others went away, only to come back again. This place belongs to Somewheres, to people who live somewhere, who are from this place—Sunderland—even after they are dead and gone. Or, rather, dead and not gone. Me, I am an Anywhere, someone who can live anywhere. Like everyone else, I am a scoop of clay animated by the breath of God. But where God found that clay is anyone’s guess. My family are scattered to the four winds, my wife’s family also. We grew up 300 miles apart, and met in a third city entirely. We’ve all but lost track of how many times we’ve moved, still find an adrenalin to it. In the Bible, YHWH, the Creator God, is described as a wanderer. So is the satan, the accuser. And so am I. An Anywhere can live anywhere, comes not from Somewhere but Nowhere. To the Anywhere, nowhere is Somewhere. We can live anywhere, but it is hard to do so Somewhere. Never mind the other Anywheres, the Italians and Indians and Chinese operating restaurants all along the promenade at Seaburn. You’re nobody in this town if you’re not from here. Invisible. This is holy ground, but God, it is a sparse strip. One path there and back again, sometimes bringing you near the centre, only to turn you away. We keep running, a 10K loop along the coastal path to the Souter lighthouse and back again. Past the endless benches facing out to sea.